In this page I will be linking to posts, other material and translations relevant to a crowd-source, investigative project about Derwick Associates. Ultimas Noticias journalist Cesar Batiz in Caracas is collaborating. Is the Bank of Spain laundering Derwick Associates' money? Whatever happened to CVG's $500-million held in Gazprombank? London 01.12.12 - The image on the right is the first page, of what sources alleged to be a two-page fax, sent by Alejandro Betancourt to buyers of steelmaker Corporación Venezolana de Guayana (CVG). 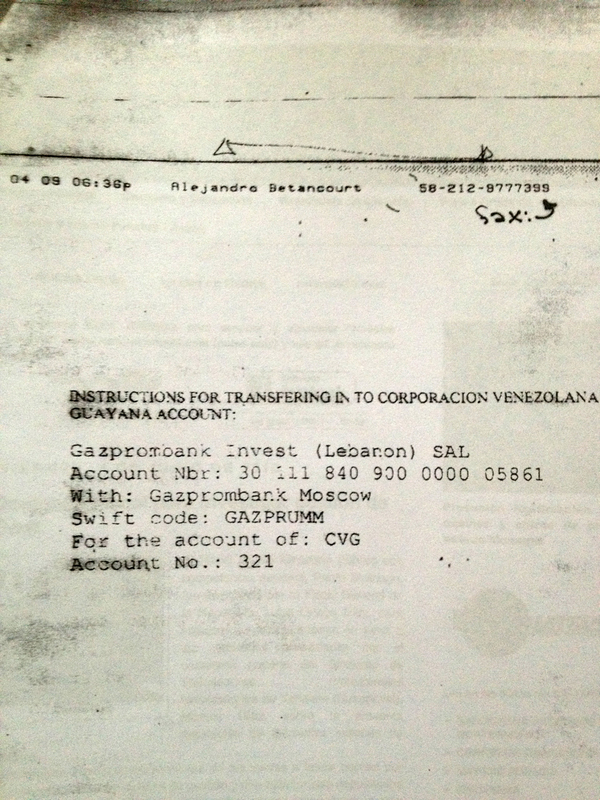 Its contents are quite self explanatory: date (Sep 04 09), time (06:36pm), name of sender (Alejandro Betancourt), fax number from where it was sent (58-212-9777399), and instructions to buyers to pay / transfer into a Gazprombank account. Diaz Ferran detenido por blanqueo de dinero. ¿Y qué de Derwick?